United Tribes Ensign: 20th March 1834: 25 Chiefs from the Far North gathered at Waitangi to choose a flag to represent New Zealand. The preferred design received 12 out of the 25 votes. Busby declared the chosen flag the national flag of New Zealand and had it hoisted on a central flagpole, accompanied by a 21 gun salute from HMS Alligator. The middle flag On the painting: I created a triangle pennant, it includes the cross, star and cresent of which were often represented on historical Maori pennants. The regular use of these symbols shows the influence the missionaries and introduced faith had on the Maori culture. The New Zealand Red Ensign: New Zealand Government ships must fly the New Zealand Flag. Other New Zealand ships may fly the New Zealand Flag, the New Zealand Red Ensign, or any flag authorised by either the Sovereign or the Governor-General. It has been based on the Red Ensign usually flown by merchant ships registered in the United Kingdom. 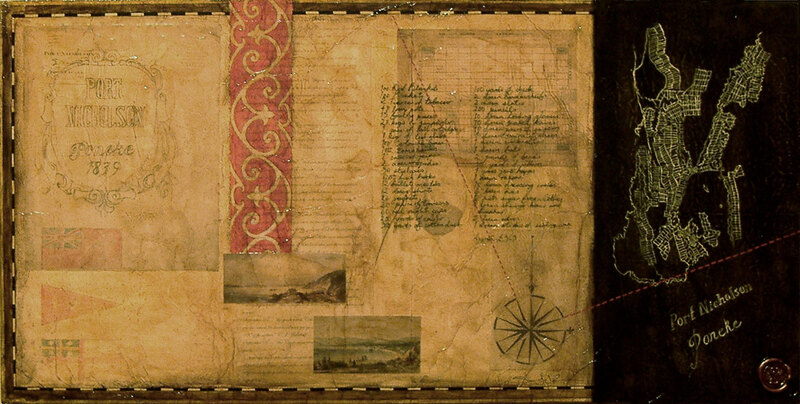 Included on this painting is the list of goods exchanged for the Wellington region, an image of Edward Gibbon Wakefield, the driving force behind much of the early colonisation of New Zealand and various maps of Wellington before the building ever began.